There are all sorts of great patterns with hearts on them that would make great presents for Valentine’s Day and beyond. Today I’m taking a look at some pretty mitts, projects that you might just still have time to knit before the holiday this year! Kat at Just Crafty Enough has made some really cute conversation heart mitts that would be perfect for your valentine or even for a favorite teenager. And the Hearts Abound Fingerless Mittens by Molly Matters have a simple row of hearts along the top that’s cute and easy to execute. The Be Still My Heart Mittens by Sam Stevenson are really cute and cozy, worked in double knitting for extra warmth with heart motifs on both sides. 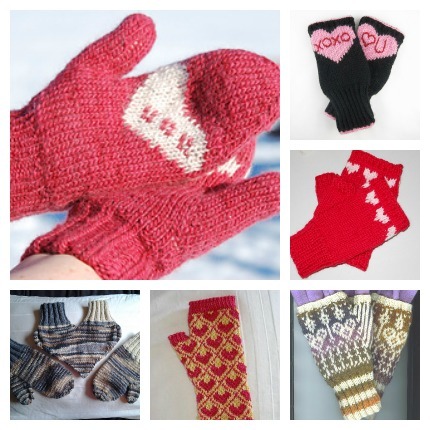 Margaret Edelson’s I Heart Mitts have a pretty allover stranded knitting pattern and are long for extra warmth. The Rainey Sisters have cute Sweetheart Glovelets that use a pretty eyelet pattern to make a heart on the back. These also have a fun cuff detail you’ll want to check out. Also give the Heart Mitts by Steven Frieson a look. They have a similar eyelet pattern but just use a hole for the thumb. Kathleen Taylor’s Stranded Fingerless Mitts use hearts as part of a colorful motif that would be great throughout the year, while the Heart of the Mitten from DROPS is a lovely, cozy mitten pattern with hearts all over. And if you really want to stay connected to your loved one, try the Heart Mittens for a couple by Mister Winter. One side of the “pair” is really two mittens worked together in a heart shape so you can hold hands and stay warm at the same time. Aww. Gosh, I love all of these patterns! Kathleen Taylor’s stranded mitts are especially gorgeous. Pinning now to my knitting board 🙂 Thanks so much for sharing these Valentine’s knits! !